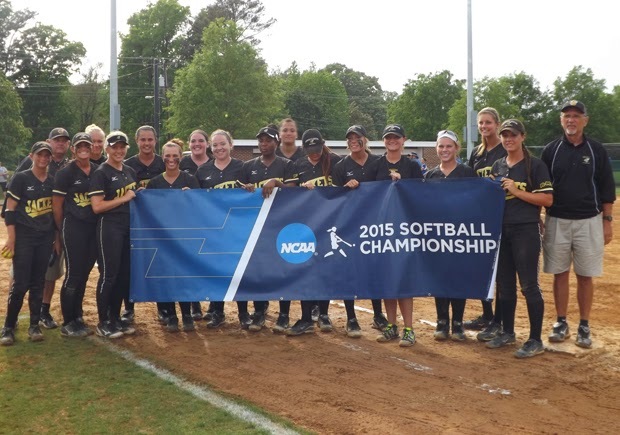 The 2015 season came to a wet and disappointing end Sunday afternoon in Newport News as region host Christopher Newport completed their second victory over the Yellow Jackets during the weekend, 11-6, to earn a berth in the NCAA Division III Tournament Super Regional next week in Salisbury, Maryland. For Randolph-Macon, it ended a topsy-turvy, crazy three-day odyssey on the diamond, where they finished 2-2 in the regional, and ended this historic season with a record of 28-12. After a wild, come from behind 8-6 first round win in nine innings over Ramapo College, the New Jersey Athletic Conference champions, on Friday, the Yellow Jackets returned to Captains Field Saturday to face the hosts. Randolph-Macon fought hard, but fell to Christopher Newport 3-2 to drop to the elimination bracket against Salem College. The Yellow Jackets and Salem were tied when darkness suspended their game. Restarted Sunday morning, freshman Skylar Toth's two-run homer in the 12th started a four-run rally that proved to be enough to eliminate Salem 8-6, earning a berth in the championship round against the Captains. But rested Christopher Newport spotted Randolph-Macon four first-inning runs, scoring ten runs in the third, fourth, and fifth innings, to pull away. Two rain delays due to subtropical storm Ana lengthened the day for the Randolph-Macon faithful, with the Captains wrapping up an 11-6 win just after 5pm, over seven hours after the Salem game was resumed. Randolph-Macon ends their season with a promising future, though they must replace the double-play combination of power hitting shortstop Sharese Jarvis and leadoff hitting second baseman Amanda Sopko. Relief pitcher Carly Alford provided a boatload of leadership on and off the field this season.